Fair Flavors: Victory is mine! Never in my adult life have I bought a whole coconut. I remember my mother occasionally bringing home a coconut and then my dad had to open it with al kinds of tools (or maybe it was just one tool, I can't remember clearly, but it definitely looked like a lot of work). I guess that intimidated me a little into thinking that opening coconuts was a lot of work. Or at least required a lot of muscle (I also believed my dad was very, very strong) or tools. Last week my eye suddenly caught a coconut in the supermarket. Of course they sell them since forever, but my intimidated-by-whole coconuts-mind probably just never really registered them. I would just buy canned coconut milk or desiccated coconut, but never a whole coconut. But this time it was different. I decided there and then, in the supermarket, at the fruit and vegetable section, I was going to buy this coconut and I would conquer this ancient and childish fear of cracking that nut! The coconut sat in the pantry for three days. Today, I decided, was going to be the day. Of course I first did what I always do if I have a "how to" problem, I searched the internet for ways to "open a coconut without making a mess". Well, there are a couple of ways. I decided I was going to try this method. Because I was afraid that I would have coconut water splattering all over the place, I wanted to get the water out first. I read somewhere that you can pierce one of the eyes on top of the shell. Well, that was the easy part. There are three eyes and one of them looks slightly different from the other two. That's the one you can pierce. Just stick a small sharp knife into it and turn it around a couple of times. Now there's a small hole through which you can pour out the water. I grabbed a chef's knife and started striking the top of the coconut while turning it every few strikes. Nothing happened. I struck it a couple of times more, but still...nothing happened. This called for a more agressive approach. I went through the kitchen drawers to find a suitable tool for the job. 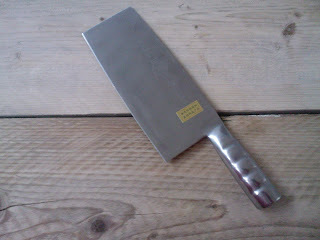 At the bottom of a drawer I found my Chinese cleaver. Now this knife was a gift from a friend and I had never used it. Again, because I was slightly intimidated by it. I mean, have you ever held a Chinese chef's knife? It's big and heavy and razor sharp and it can do some serious damage. But since I was already trying to conquer my fear of coconut opening, I decided this might be a good time to conquer the Chinese chopper fear too. With the sharp side of the knife I started striking the coconut again. Careful, but determined. After a couple of well placed strikes, the shell started cracking and one final and brutal strike did the trick: the nut was cracked and I had fresh coconut meat. Now...what to do with it? *Edit: It's been a while since I wrote this post, and there's an even easier method for opening coconuts. After you let the water out, grab a hammer. Grab the nut in one hand, hammer in the other and hit the nut halfway, turn it a little, hit again, turn, hit...and repeat. After about 5 or 6 hits, it starts to crack. Without too much force. My fear for coconuts is completely gone. I've cracked many coconuts this way and it works great!